On the day Sean McVay was born – January 24, 1986 – Bill Belichick was already entrenched as defensive coordinator of the New York Giants, planning strategy that would eventually lead to the team’s Super Bowl XXV win over the Denver Broncos. As time passed, the less important their age discrepancy became. And on Sunday, remarkably, they will be in the same place, Mercedes-Benz Stadium in Atlanta coaching their teams in Super Bowl LIII. The Patriots, relying again on Tom Brady and cornerstone principals characterizing their franchise 2001, will play their third straight league title game and ninth since Belichick arrived. 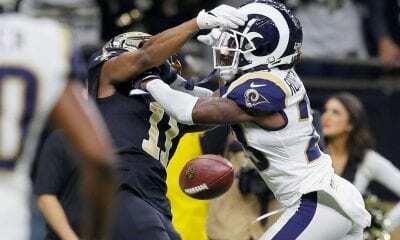 The Rams, an upstart led by the offensive innovation of McVay and an often underrated defense powered by indefatigable tackle Aaron Donald, the reigning defensive player of the year, will attempt to become the second straight NFC team to win the Super Bowl. 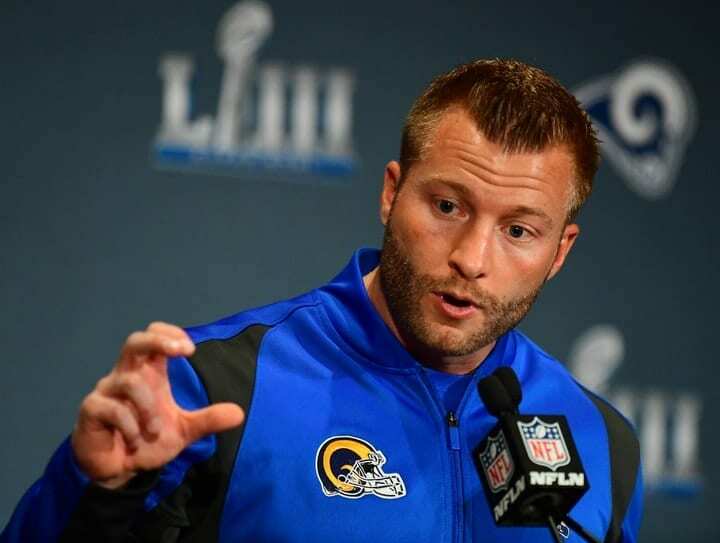 If the Rams win, McVay, 32, will become the youngest head coach to hoist the Lombardi Trophy. If the Patriots win, Belichick will have his sixth title and be one step closer to the Hall of Fame. 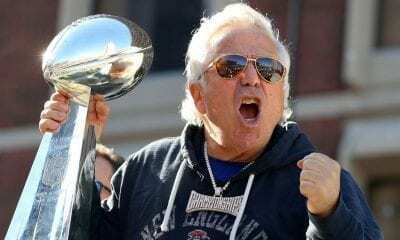 ”Really, this is the first time that I’ve coached in a Super Bowl, so you lean heavily on coaches in our building, even some of the players that have had experiences with this. For the most part, what we’ll try to do just based on the understanding that I have,” said McVay. “You really want to kind of treat it like a normal game week, understanding you’ll continue to tweak your game plan. For the last week, the game has been analyzed inside-out by every possible pundit media outlets could mobilize. It is this way every year. Everyone has a theory. Anyone can fashion a yellow brick road. One more thing is also true: It’s just a football game, one that will be won or lost by great plays, untimely errors or unexpected sideshows such as missed pass interference calls (the Rams) or offside calls nullifying game-clinching interceptions (the Patriots). We’ll just have to wait and see upon whose shoulders the confetti falls. If there is one slice of strategy that seems to stand out, it’s the Patriots ability to keep Brady upright. They have done so with boundless success in the postseason, averaging 39 points. Neither San Diego or Kansas City sacked the GOAT and the Chiefs came into the game with a league-leading 52. The greatest quarterback ever to play the game is bright, instinctive, experienced and clutch. But he is not mobile and he can’t afford to spend the entire moving the ball on slant patterns to Julian Edelman. Eventually, Brady will drop back, his body erect, and look downfield. And that’s when the Rams defensive front, led by Donald (20 ½ sacks), Dante Fowler and Ndamukong Suh, could seriously impact the game. “He [Donald] is pretty much unblockable,” said Belichick. Just two years ago, the ability of the Atlanta Falcons to pressure Brady in the first three quarters almost led to New England’s demise in Super Bowl LI. The Falcons tired and the Patriots mounted their epic comeback. Last year, New England smartened up. The Pats picked up the pace and Brady threw for 505 yards, but their defense could not stifle the Eagles. This is not to say that pressuring Brady is the only way to beat him. The Rams advanced to the Super Bowl without dumping Dak Prescott or Drew Brees. But the more time Brady has to think, the better chance he has to kill you. Ask the Chiefs. It would be to New England’s advantage to also rush the ball, simply to keep it away from Rams quarterback Jared Goff and McVay’s pioneering mind. And in rookie Sony Michel, the Patriots have one of the finest young halfbacks in the league. It might also benefit New England offensive coordinator Josh McDaniels to introduce some play-action since the Rams have often had problems over-reacting to the sleight of hand. Opposing quarterbacks have a 131.2 passing rating against Los Angeles this season on ball-fake plays (91-of-121 for 1,153 yards and 14 TDs). On the other side of scrimmage, the Rams present multiple weapons to deal with, much like the Chiefs did two weeks ago in the AFC Championship Game. While Goff is no Pat Mahomes, he does have many toppings to pick from: running backs Todd Gurley and C.J. Anderson and receivers Brandin Cooks, Josh Reynolds, and Robert Woods. Anderson has provided a serious boost to an already potent unit. He has carried the ball 39 times for 167 yards and two TDs in the playoffs. If the Patriots have a vulnerability (we say this every year), its likely on defense and in their secondary. It will be fascinating to see which aspects of the Los Angeles offense, and which particular players, Belichick chooses to neutralize. He has always been one to force an opponent to beat him doing something relatively uncomfortable. Goff threw 32 TD passes and 12 interceptions, and while he’s had an exceptional season, he has never been considered among the top-flight quarterbacks. The Rams are 24-8 under him in the last two seasons. But over the last 10 weeks, he played to just a 92.9 quarterback rating, which puts him squarely into the average box, right there next to Cam Newton. 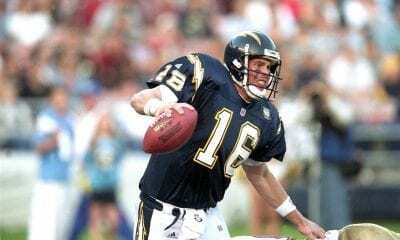 Let’s put it this way: If you had to win one game, what are the chances you’d pick Goff over Brees, Brady, Philip Rivers, Mahomes, Aaron Rodgers or, maybe even, Eli Manning?